Madsen, Peder. Johannes’ Aabenbaring: Indledet og fortolket [The Book of Revelation: Introduction and Commentary]. 1st ed. København: G. E. C. Gad, 1887. 2nd ed. 1896. Both editions were published in two parts, the two first volumes in 1885 and 1894. The libraries disagree as to the number of pages. The first edition consists of either x + 730 pages or viii + 727/728 pages (the first 286 pages were published in 1885); the second of x + 731 pages (the first part being published in 1894). 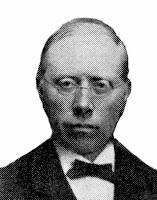 Peder Madsen (1843-1911), a Danish theologian, was professor of systematic theology at the University of Copenhagen (1875-1909) and the Bishop of Zealand (1909-1911). As a postgraduate theologian, Professor Madsen studied with the professors Gottfried Thomasius, Johann Christian Konrad von Hofmann, Franz Hermann Reinhold Frank, and Gerhard von Zezschwitz in Erlangen, but he was no pupil of any theologian. According to Frederik Torm, who as professor of New Testament was Peder Madsen’s colleague and later his biographer, Peder Madsen has written more thoroughly on the history of interpretation than any other (Biskop Peder Madsen , p. 100f). Fifteen years later, Torm published his own – popular – commentary on Revelation. Peder Madsen himself singled Th. Kliefoth out as the one he had learned very much from, although he was from time to time very critical of him. As the first interpreter (so Torm), Madsen discusses the fundamental interpretive questions of Revelation as a prerequisite for the interpretation of the many details.